One of the most colourful festivals in the world has to be Holi Festival which is celebrated in India every year. Holi festival is also known as the festival of colour. People use holi colours to smear each other.Holi festival is a fusion of colours when the entire atmosphere becomes extremely colourful. To celebrate and enjoy the festival of Holi or the festival of colours you need to know the background of the festival so that you can not only enjoy but also get to know the nuances of the festival. 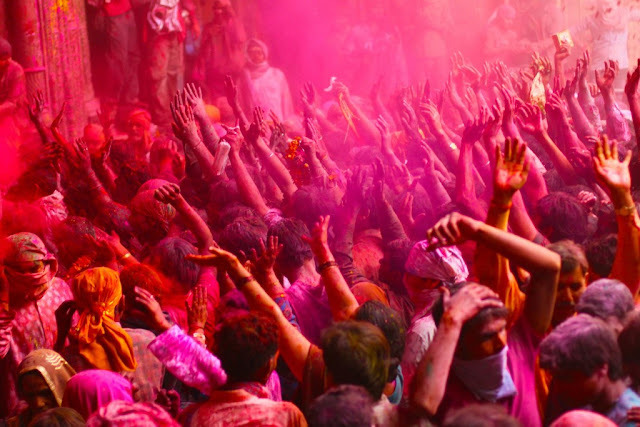 What is Holi Festival and Why Holi is celebrated? Holi is celebrated across many regions in India and in most of the places Holi is celebrated for 2 days where people play with colours. 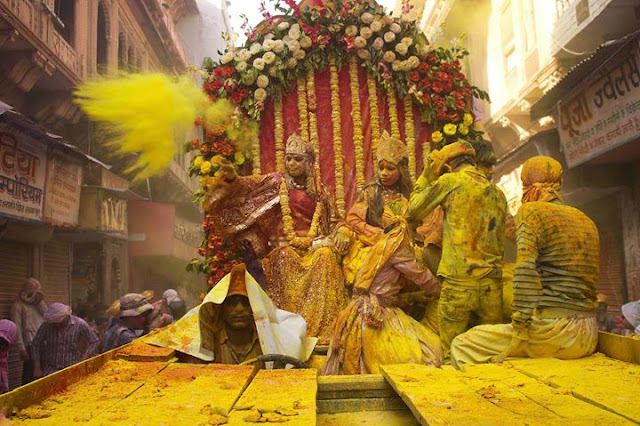 However one of the most colourful and interesting places to celebrate Holi is in Braj (covering the areas of Mathura, Vrindavan & other nearby areas) also called the Braj Holi. Lord Krishna lived in Vrindavan where he grew and The Lord used to take his cows to graze in the fields. 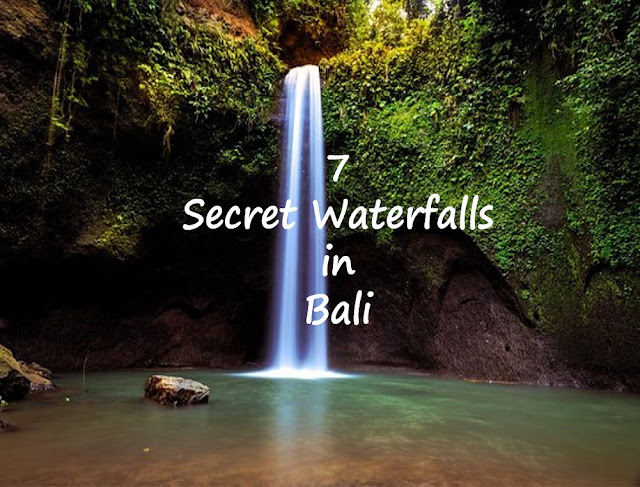 The Lord's friend Radha used to stay in Barsana where Lord Krishna used to go and visit a lot. The legend of Braj Holi goes as; once Lord Krishna became jealous about the fair complexion of his beautiful ladylove, Radha and went to Barsanawith his friends to smear the coloured powder also called Gulal. After smearing the coloured power on Radha, Lord Krishna was not leaving the place.Then Radha and her friends Gopis bet the Lord and his friends with Bamboo sticks and they ran back home. The people in the villages believe that they are the descendants of Lord Krishna.Hence they keep this legacy close to their lives and celebrate it to its fullest extent in order to strengthen their beliefs. 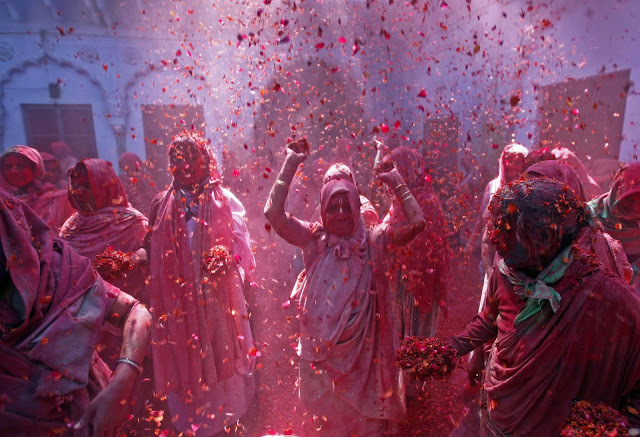 Holi in Mathura begins a week before the actual Holi. Every year I hear photographers and travellers getting confused on when should they go and where should they go to witness the holi festival in Mathura. 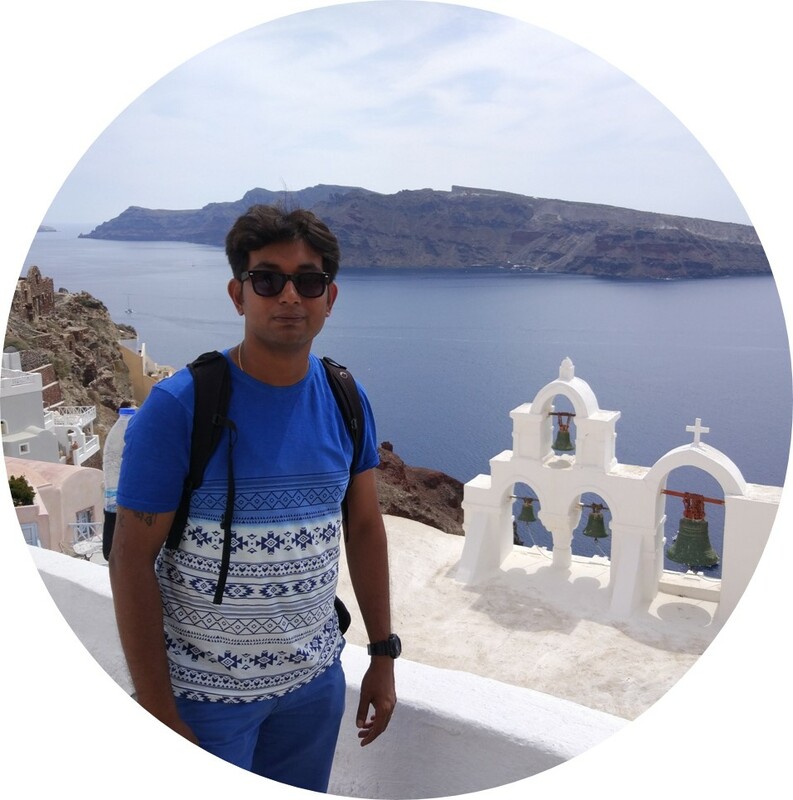 When I tried to find out when I should go, i got many confusing answers from my friends who had gone there before. Hence, I have chalked out a date wise chronological plan to visit Mathura during the festival of holi. Important :The dates of Holi for the years 2019-2022 are tentative. These might change depending on the hindu calendar. Mathura is approximately 180 kms from New Delhi and takes 4 Hrs to reach there by road. You can also take trains from New Delhi to Mathura which takes approximately 2 hours to reach. You need to book the train tickets well in advance or else you will not get a confirmed ticket during this period. Mathura to Barsana distance is approximately 50 Kms and will take 1hr - 1hr30mins by road. You will get many options to stay in Mathura and Vrindavan. You just need to ensure that you book the hotel well in advance. You can get staying options for every budget. You will get staying accommodation from as low as $10 per night. However a good hotel will charge you approximately $20+ per night. 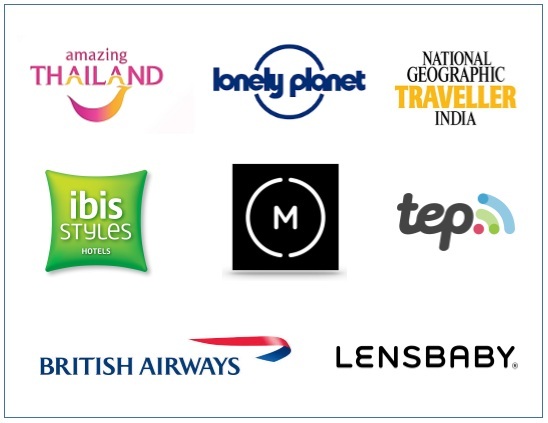 My suggestion is to take a decent hotel by paying a little bit extra rather than taking absolutely cheap accommodation as the basic accommodation might not be always good in these locations. The following is the detailed map for enjoying Holi in Mathura. 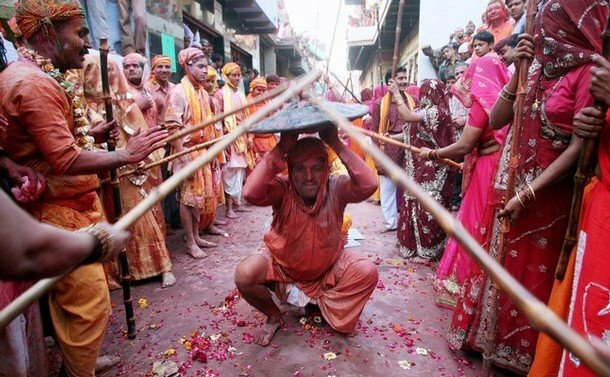 This is a different kind of Holi where the women beat the men with sticks( Lathi in Hindi) and hence the name Lathmar Holi ( beating with sticks). The story behind this kind of Holi is that Lord Krishna visited Barsana to meet Radha to play Holi and started teasing Radha and her friends. The women got irritated and beat Lord Krishna and his friends with sticks to drive them out. On the first day men from Nandgaon visit Barsana. They pay their prayers at Radha Rani temple and then head to Barsana village to get beaten up. This is the second day of the Holi celebrations. 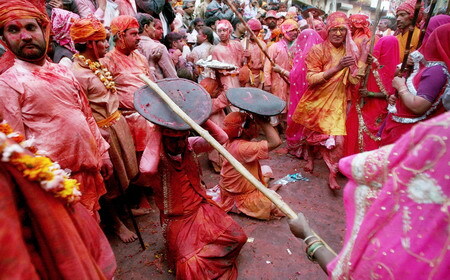 On this day men from Barsana visit Nandgaon and play the Lathmar Holi there. The celebrations are exactly the similar to Barsana. This is a completely different kind of Holi where instead of colours Holi is played with Flowers and hence the name Phoolon ( Flower) wali holi. Head to Banke Bihari Temple and reach there before 3pm and stand in the queue ( if there is any). 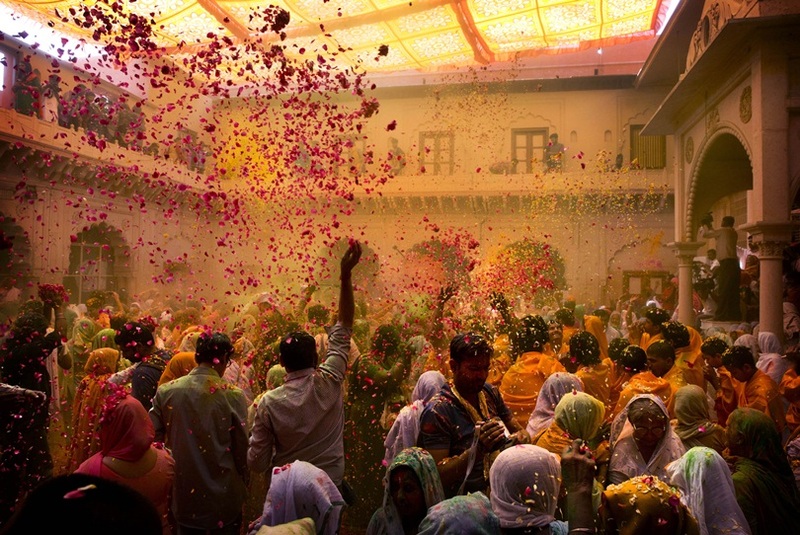 The gates of Banke Bihari Temple opens at 4pm and the Flower Holi starts immediately. The phoolon wali holi ( flower holi) is celebrated for approximately 15-25 mins and is not a very elaborate holi. If you are planning to photograph then the window you get to photograph the event is very small and hence plan your shots in advance. Don't be late or else you will miss the event completely. This event is not really important and can be easily missed. This day people play holi normally and you will not find huge crowds on the street. This day is good for photography as the streets and temples are relatively empty compared to other days. Earlier the Widows were not allowed to play Holi , however 3 years ago the tradition was broken and the widows were allowed to play Holi. Widows celebrate holi at Pagal Baba Ashram and its absolutely a must do event. The holi celebrated by the widows are worth photographing and you will find many photographers there. 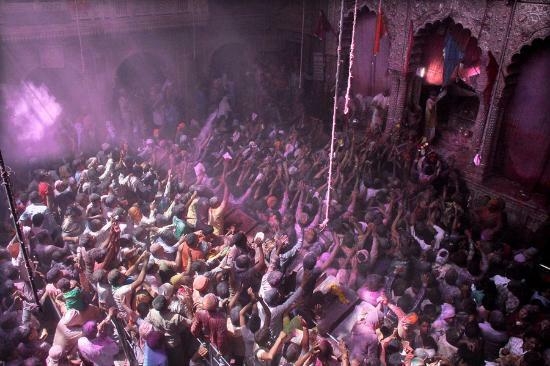 Head to Banke Bihari temple in Vrindavan for Holi celebrations.on this day. The holi celebrations take place here one day before the actual Holi. The gates open early in the morning approximately at 9am.The priest of the temple throws colour and water on the crowd.Its an amazing experience to witness this and you are bound to feel out of the world here. Holi is played here till 1:30pm. After witnessing the Holi at Banke Bihari temple head to Mathura for thh Holi procession and Holika Dhahan. The procession in Mathura starts at Vishram Ghat. Few vehicles are decorated with flowers and people ride on it during the procession. Everyone is smeared with colours and the entire atmosphere become really colourful. In the evening head to the Holi Gate for Holika dahan. The effigy of Holika is burnt at the Holi Gate and you can witness many cultural programs. 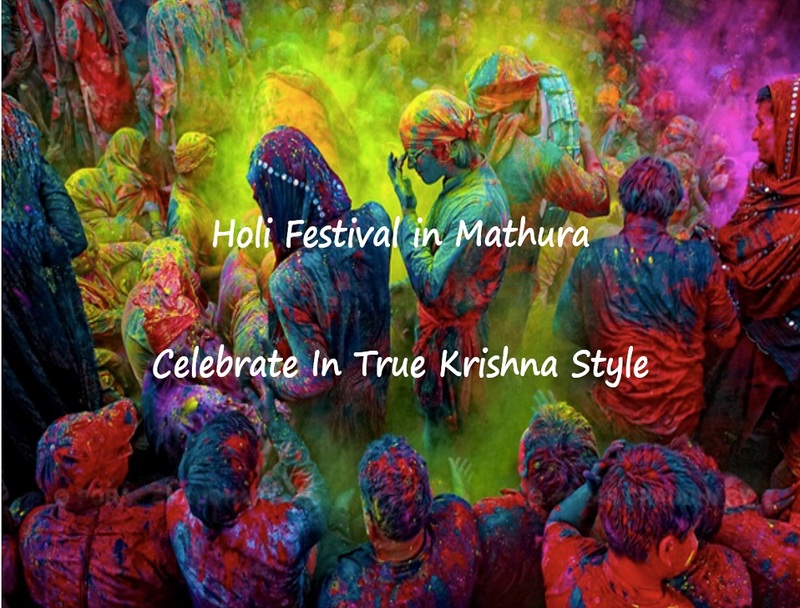 Start your day early in the morning as this is the day when Holi is played with pomp and show at Mathura. You can find priests making Bhang ( an edible preparation of cannabis). Try a glass of Bhang if you don't get intoxicated easily. The gates of Dwarkadheesh/Dwarkadhish temple open at 10am and crowds flock the temple compound to play holi. Important tip : Stock your hotel room with food as you will not find any restaurants which will serve you lunch or dinner this day. 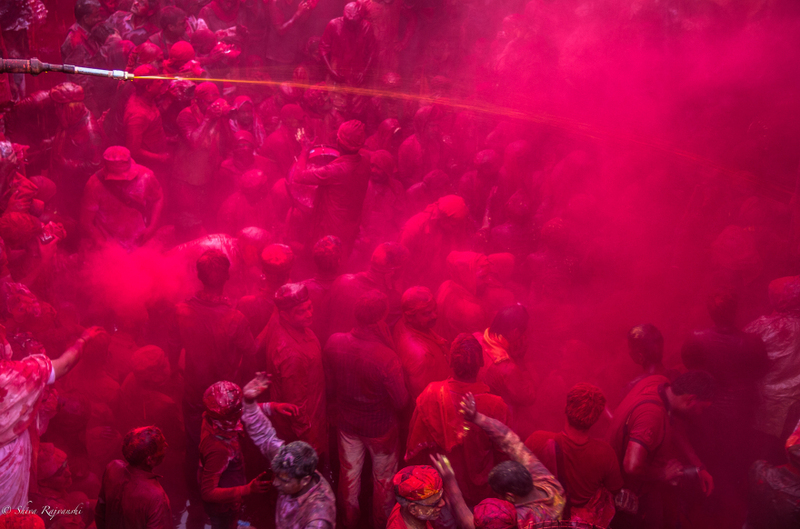 Most of the colourful photographs that you see of Holi in Mathura on internet is captured here. Dauji temple is located approximately 30 kms from Mathura and it is held next day after the Holi festival. The event is photographed by many photographers and hence you have to go early approximately 8am-10am to get hold of good places on the rooftop. The actual event starts at approximately 12:30pm and goes on for 4 hours. Enjoy your Holi in Mathura in true Krishna style and don't forget to share your lovely photographs with Shoestring Travel so that we can feature you in an upcoming Holi photostory.